Team Stars & Stripes celebrated a fantastic week visiting Ireland and Scotland with a 55-8 win over the East Kilbride Juniors at the University of Stirling. Under head coach Bill Gallagher and longtime Stars & Stripes coach John Storey, the select team of high school seniors were led by four rushing touchdowns from Matt Kosar of the Gilmour Academy (Cleveland, OH). Villa Angela St Joseph (Cleveland, OH) pair Jeremy Neylon and Andrew Oriani also scored on the ground, while Ben Gerber connected with Haverford School (Pa.) teammate Nick Chermol for an end zone reception and rushed himself for a score. Kicking off in 46 degrees and rainy weather, the Americans breezed into the lead as Kosar rushed 59 yards for a touchdown and Matt McGinn of Villa Angela St Joseph tagged on the extra point. Kosar again found the end zone on the ground, this time from 39 yards to double the first quarter advantage. Having led 14-0 after the first quarter, a 7-yard Gerber touchdown run was followed by a fumble recovery by Wayne Derkotch, setting up Gerber to pass to Chermol for the touchdown. Team Stars & Stripes extended the lead to 36 points as Kosar headed to the end zone again, this time on a 3-yard run and Neylon tossed a 2-point conversion to Chermol. 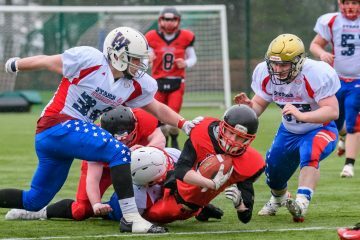 East Kilbride Pirates got on the board before halftime as building on 40 yards gained on a long pass completion to Michael Paton, Jack Cochrane took the ball to the end zone for the score and added on a two-point conversation, making the score 36-8. There was time for another American touchdown and a 42-8 interval lead as Oriani ran in a 6-yard touchdown. Touchdown runs from Neylon and Kosar earned Team Stars & Stripes a 55-8 win following a scoreless third quarter. While in Ireland, the traveling high school players enjoyed visits to St Patrick’s Cathedral, Trim Castle, the Gaelic Athletic Association Museum, Croke Park and the Guinness Storehouse. From Dublin, they headed north to visit Belfast before boarding a ferry to Scotland for walking tours of Edinburgh and Glasgow. Despite the almost inevitable heavy loss, acting Pirates head coach Nicky Smith was confident that his players would benefit from the experience, having witnessed the standards that they should be working towards. They open their 2019 League campaign away to Highland Wildcats on April 28.